Availability of search engine results are the sole responsibility of integrated operations system, either in terms of availability or descriptive information such as rates, services offered, and photographs. In no event SDHPA can not be held responsible for information fourniées in this part of the site. This site is normally accessible at all times to users. Interruption due to technical maintenance can be however decided by www.campingsdordogneperigord.com, which will then endeavor to communicate to users before the date and time of the intervention. Www.campingsdordogneperigord.com The site is regularly updated by Camping Dordogne. Similarly, legal notices may be modified at any time: they still require the user who is invited to refer to it as often as possible in order to become acquainted. Www.campingsdordogneperigord.com The site aims to provide information on all of the company's activities. Campsites Dordogne strives to provide the site www.campingsdordogneperigord.com as accurate information as possible. However, it can not be held responsible for omissions, inaccuracies and deficiencies in the update, whether its fact or because of third party partners that provide this information. All information listed on the site are www.campingsdordogneperigord.com given for information and are subject to change. Furthermore, the information on the site www.campingsdordogneperigord.com are not exhaustive. They are given subject to changes being made since they are online. 4. Description of Services Provided. Campsites Dordogne owns the intellectual property rights or has rights to use all the items available on the site, including text, images, graphics, logos, icons, sounds and software. Any reproduction, modification, publication or adaptation of all or part of the site elements, whatever the means or process, is prohibited without prior written permission of: Camping Dordogne. 6. Intellectual property and counterfeiting. Campsites Dordogne not be held liable for direct and indirect damage to the user equipment, when accessing the site Camping Dordogne, and resulting from the use of equipment not meeting the specifications of point 4 or the appearance of a bug or incompatibility. Campsites Dordogne will also be liable for consequential damages (including for example a loss of market or loss of opportunity) arising from use of the site www.campingsdordogneperigord.com. Interactive spaces (opportunity to ask questions in the space contact) are available to users. Campsites Dordogne reserves the right to remove, without prior notice, any content posted in this space that would violate the law applicable in France, particularly the provisions on data protection. If necessary, Camping Dordogne also reserves the option to challenge the civil and / or criminal liability of the user, especially in cases of post racist, offensive, defamatory, or pornographic, whatever the medium used (text, photography ...). 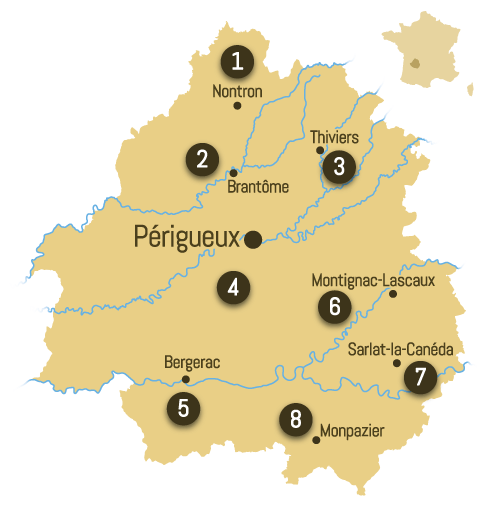 On the occasion of using the site www.campingsdordogneperigord.com, can be collected: URL links through which the user accessed the site www.campingsdordogneperigord.com, the access provider of user, the Internet Protocol (IP) address of the user. In any event Campsites Dordogne collects personal information about the user and the need for certain services offered by the www.campingsdordogneperigord.com site. The user provides that information with full knowledge of the facts, especially when conducting itself to capture. It is then said to the site user www.campingsdordogneperigord.com the obligation or not to provide this information. No personal information of the site user www.campingsdordogneperigord.com is published without the knowledge of the user, exchanged, transferred, assigned or sold to any support to others. Only the assumption of redemption Campsites Dordogne and its rights would allow the transmission of such information to the prospective purchaser who would in turn be given the same obligation to store and modify data with respect to the user of www.campingsdordogneperigord.com website. The site is not declared to the CNIL as it does not collect personal information. (Nnumero CNIL). Www.campingsdordogneperigord.com The site contains a number of hypertext links to other sites, set up with permission of Campsites Dordogne. However, Campsites Dordogne has no opportunity to check the content of the sites visited, and accordingly assume no liability therefore. The site navigation www.campingsdordogneperigord.com may cause the installation of cookie (s) on the computer of the user. A cookie is a small file, which does not allow identification of the user, but which records information about the navigation of a computer on a site. The data obtained are intended to facilitate subsequent browsing of the site and also enable various measures of attendance. In Internet Explorer: Tool / Internet Options tab. Click Privacy and select Block All Cookies. Confirm OK.
Netscape: Edition / Preferences tab. Click on Advanced and select Disable cookies. Confirm OK.
Any dispute in connection with the use of the site www.campingsdordogneperigord.com is subject to French law. It is made exclusive jurisdiction of the competent courts of Paris.